For many, the sight of gambolling lambs conjures up thoughts of warm spring days, spritely daffodils and blossoming trees. But lambing for the Hawkey family comes earlier than in many other parts of the country. With a relatively warm Cornish climate and a close proximity to the Camel Estuary, The Olde House kicks off its first lambing season mid-December as the newborns are able to cope with the weather. With over 30 self-catering cottages on its 550 acre working farm, The Olde House is a farmstay holiday provider that offers its guests an authentic farmlife experience near Wadebridge, north Cornwall. It has been owned by the Hawkey family for three generations and remains a family-run business today. There are two lambing seasons, the first beginning in December and the second in February. It’s a big driver for out-of-season tourists, who delight in experiencing the lambing first-hand and witnessing life being brought into the world. As someone who easily falls for any cute and fluffy animal, I was thrilled to be invited to the farm for a morning of lambing. I’m certainly no farming expert, but I love the countryside and getting stuck in, so I couldn’t wait to dust off my wellies and lend a hand to the Hawkeys. I arrived at The Olde House at 7.30am on a dark Saturday morning in December. I was responsible for making sure the new mums were given enough water. Admittedly, I was most interested in the pen for the orphaned lambs. Gav, who works at The Olde House and delivers hundreds of lambs each year, explained that some lambs don’t take to their mothers and so they have to be put in the pen to be bottle fed. 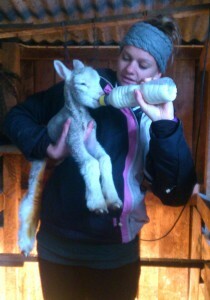 We mixed up a bottle of formula and warm water and fed the lambs who were around three days old. Within half an hour I had been called into the lambing area where a ewe had become particularly agitated, indicating she was ready to give birth. Gav laid her down and I saw two little hooves poking out. Before I arrived I’d been determined to have a go at pulling the lamb out. But when faced with it in its rawest form, I couldn’t quite bring myself to do it – so I opted to watch on instead. Gav tugged at the legs and we watched as the lamb slid out. It was an emotional moment when the ewe first saw her lamb – it was seeing nature at its purest, something that I don’t get to watch without David Attenborough’s voice over. We travelled around the fields to feed the lambs that are old enough to go outside. It’s important to check that they’re all healthy and doing well. 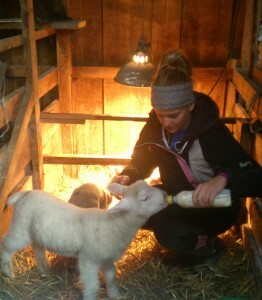 I returned to the lambing shed for one last feed of the orphaned lambs before saying goodbye to my new found friends. Over 700 sheep were born over the space of six weeks, ending on 20 December 2013. The next season starts 12 February and runs until the end of March.